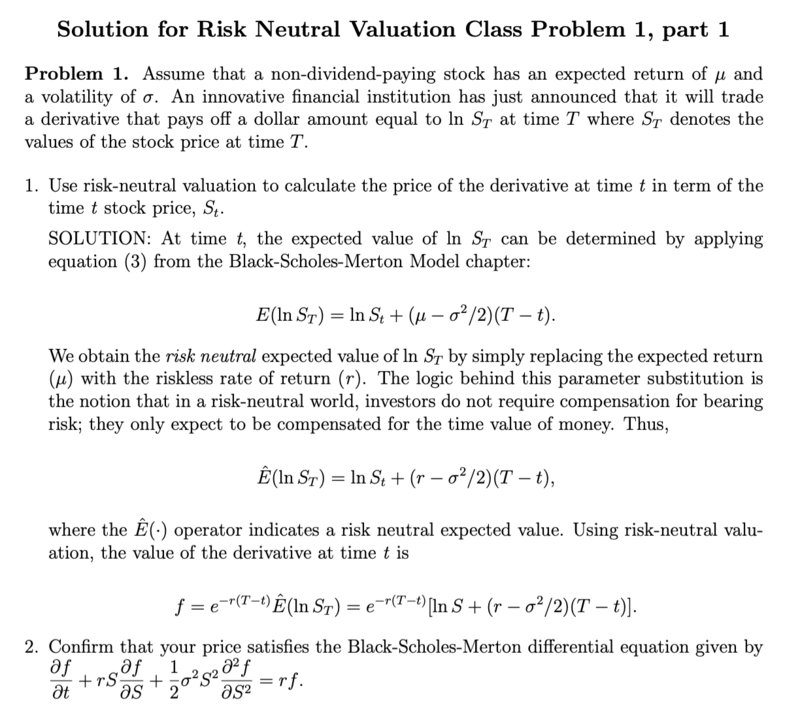 Solutions for the Risk Neutral Valuation Class Problems are now available from http://fin4366.garven.com/spring2019/Solutions_for_Risk_Neutral_Valuation_Class_Problems.pdf. Equations (1) and (2) in my “Geometric Brownian Motion Simulations” teaching note represent examples of so-called “Ito diffusions”. Interestingly, when looking at graphs produced by random number generators (such as are utilized by the Brownian Motion spreadsheet model used for this teaching note), people tend to “see” patterns in data even when no such patterns actually exist. Ito diffusions represent a specific type of reaction-diffusion process. The Wired Magazine article referenced below provides a layman’s explanation of reaction-diffusion processes in chemistry, which are characterized by reactive molecules that can diffuse between cells. A special case of a reaction-diffusion process is a “pure” diffusion process, where substances aren’t transformed into each other but nevertheless randomly spread out over a surface. 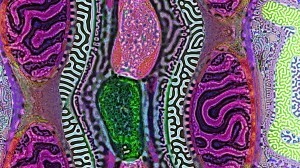 While the reaction-diffusion process makes for much more aesthetically pleasing art, other so-called diffusion processes (e.g., diffusion of thermal energy as characterized by heat equations or movements of speculative asset prices as characterized by Ito diffusions) similarly generate (what appear to the naked eye to be) “patterns” from randomness. 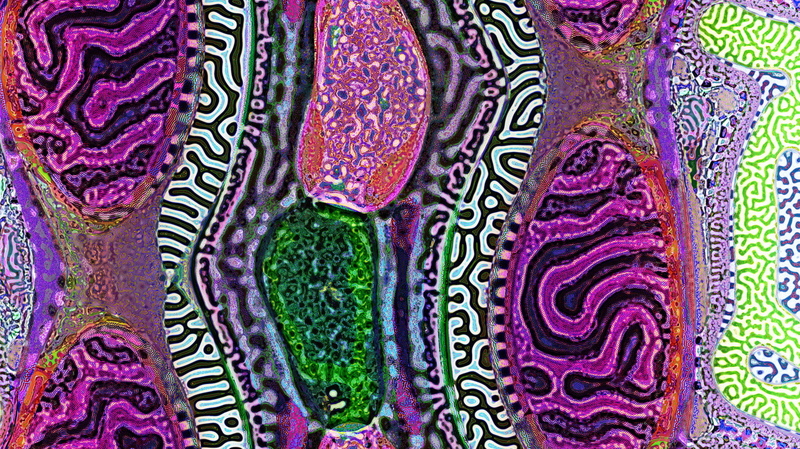 These digital canvases represent British mathematician Alan Turing‘s theory of morphogenesis. This article (from the University of Chicago Booth School of Business) provides a superb synopsis of “real world” methods (grounded in finance and related social sciences) for modeling risk and uncertainty! Researchers are developing new ways to gauge volatility far beyond financial markets. I should have posted this last week when we covered this in class, but better late than never! μ corresponds to the expected return in a very “short” time, dt, expressed with a compounding frequency of dt; in other words, it corresponds to the arithmetic mean return). μ-σ2/2 on the other hand corresponds to the expected return in a “long” period of time, T-t, expressed with continuous compounding; i.e., it corresponds to the geometric mean return. [1(1.15)(1.20)(1.30)(.80)(1.25)](1/5) – 1 = .124. [1(1)(1.20)(1.30)(.80)(1.40)](1/5) – 1 = .118. [1(1)(1.20)(1.30)(.95)(1.25)](1/5) – 1 = .131. Here is the solution for part 1 of Class Problem 1 which we worked on in class today. Since we showed that it is possible to completely eliminate risk via delta hedging, the arbitrage-free price of virtually financial derivative must equal to the risk-neutral expected value of the time T payoff, discounted at the riskless rate of interest. Between now and Thursday, please try to take a stab on your own at part 2 of this problem, which asks you to confirm that the price determined in part 1, in fact, satisfies the Black-Scholes-Merton equation (shown below, and also appearing as equation (16) in the Black-Scholes-Merton Model textbook reading! Notwithstanding the “mathiness” encountered during today’s class meeting, the result on the difference between arithmetic and geometric mean is of great practical significance. As we analytically and numerically showed, the geometric mean return is particularly important in demonstrating the adverse effect that excess volatility has on the long-run value of an investment plan. The one page PDF document entitled “Determining the Stochastic Process for a Forward Contract from Ito’s Lemma” provides the analytic details as to why and how this result obtains. Next Tuesday, I will begin class by covering this teaching note and then segueing into our initial foray of the “Black-Scholes-Merton Model” chapter. We will discuss the Geometric Brownian Motion, Ito’s Lemma, and Risk-Neutral Valuation reading in some detail and finish our time together by working on Risk Neutral Valuation Class Problems. Now that we are beginning to study in more detail the famous Black-Scholes-Merton option pricing formula, it’s time for me to shamelessly plug a journal article that I published early in my academic career which Robert C. Merton cites in his Nobel Prize lecture (Merton shared the Nobel Prize in economics in 1997 with Myron Scholes “for a new method to determine the value of derivatives”). Merton, Robert C., 1998, Applications of Option-Pricing Theory: Twenty-Five Years Later, The American Economic Review, Vol. 88, No. 3 (Jun. 1998), pp. 323-349. 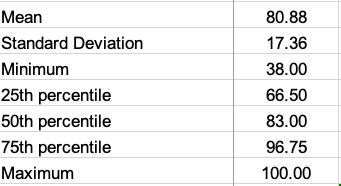 If you decide to take advantage of this opportunity, I will use the grade you earn on your report to replace your lowest quiz grade in Finance 4366 (assuming that your grade on the extra credit is higher than your lowest quiz grade). The report should be in the form of a 1-2 page executive summary in which you provide a critical analysis of Dr. Gill’s lecture. In order to receive credit, the report must be submitted to me via email in either Word or PDF format by no later than Friday, April 12 at 5 p.m. Sorry for the late notice, but here’s an extra credit opportunity for Finance 4366. You can earn extra credit by attending and reporting on Dr. David Audretsch’s talk entitled “Entrepreneurship and Economic Growth”. Dr. Audretsch’s talk is scheduled for this afternoon from 4-5:15 in Foster 240. If you decide to take advantage of this opportunity, I will use the grade you earn on your report to replace your lowest quiz grade in Finance 4366 (assuming that your grade on the extra credit is higher than your lowest quiz grade). The report should be in the form of a 1-2 page executive summary in which you provide a critical analysis of Dr. Audretsch’s lecture. In order to receive credit, the report must be submitted to me via email in either Word or PDF format by no later than Monday, April 8 at 5 p.m.